Salmon fishing hit the big screen last week with the release of the film adapt-ation of Paul Torday’s novel Salmon Fishing in the Yemen. Many of the fishing scenes take place not, as the title suggests, in the Middle East, but on the River Spey, widely regarded as one of Scotland’s finest. Although it might encourage a few more budding fishermen and women out to cast a fly this summer, the sport as a whole is already very popular in the UK. 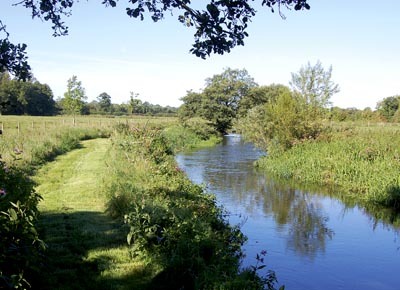 Thanks to investment by the Environment Agency, conservation groups and other interested parties over the past few decades, Britain’s rivers have been transformed. Fish stocks have grown, as has interest in properties with riparian rights. The challenge for someone in the market for such a property is finding one, as the supply of gold-standard fishing properties is but a trickle each year. North of the border, the must-have accessory for a keen fisherman with an eye on the big prize would be an eight-bedroom Georgian house with a three-quarters-of-a-mile beat on the River Spey or River Tweed, explains Robert McCulloch of Strutt & Parker, who specialises in the sale of fisheries (0131-226 2500). But these are rare and expensive. ‘We’ve got people on our list who say they’re willing to wait years if necessary.’ The buyer may well have a vision of retiring to this sort of property, so is prepared to be patient. Despite the hefty prices that you can charge for a rod on one of the big rivers (£500 per day on prime beats of the River Tweed, £600 per day for top-quality Test), nobody goes into owning a fishery with the idea of turning a large profit. ‘In general, if you can match your income to your outgoings, you’re doing very well,’ advises Mr McCulloch. To give an approximate idea of the outgoings, a full-time ghillie on a River Tweed beat might require a cottage and vehicle and a salary of between £25,000 and £30,000. On a lesser stretch of the river, where the ghillie is a local man and works part-time, the salary would be in the region of £5,000 a year. Next, there’s the annual levy to the river fishery board, which can vary from £10,000 for a beat on a major river to a few hundred on a lesser stretch. Added to this are the general costs of maintenance. In the South, costs will, again, vary depending on whether you need to employ a river keeper, who will earn towards the top end of the ghillie salary, says Charlie Seligman of Savills (01962 841842), and how you want to stock the river. ‘The more commercial you want to be with your fishery, the more you’ll need to stock it-and fish are expensive,’ warns Mr Waterton.